“But, as it is, we have the wolf by the ear, and we can neither hold him, nor safely let him go. Justice is in one scale, and self-preservation in the other.” – Thomas Jefferson, in a letter to John Holmes, April 22, 1820. Jefferson used this analogy frequently in reference to slavery (which believe it or not, as a slave owner, he attempted to abolish more than once), but it applies the War on Terror, among other things. Please keep this quote in mind as you read what follows. By the end of our wars, this is always the pattern. Since World War II, we've always regretted going to war once the media-generated fear and fervor wears off. Again, we got all whipped into a frenzy by the media before Vietnam, where my father served three tours, and then by the end we regretted it. The Vietnam War not only had full support of the American media, but support for escalating the war was achieved by the CIA’s execution of a false-flag attack (a now-declassified event that I detailed here). In the beginning, the Vietnam War held a 61% approval rating, while only 24% said it was a mistake. Before the end of the war, it had reversed itself, with 61% saying it was a mistake, and 28% saying it wasn’t. And support for our current War on Terror, which began as Operation Iraqi Freedom in 2003, sat at 76% in favor one year before the invasion (only a few months after 9/11), and 71% in favor as the invasion began. By 2013, 53% of Americans thought the Iraq War was a mistake. This, from July of 2016, is one of many examples illustrating why terrorism is getting worse rather than better. If you honestly put yourselves in their shoes, wouldn't you hate any government that did this to your family? I know I would. The war in Afghanistan started out at 93% in favor, but by 2014, 49% of Americans said it was a mistake, while only 48% said it wasn’t. Now, it’s hard to find current approval ratings for the War on Terror in general, but in December of 2016, Gallup’s survey on the direction of the United States as a whole sat at a historically low 27% in favor. That means 73% of the country is not happy. If only 27% of your customers at your company were satisfied, you’d be out of business in no time. But not only does the government keep on keeping on, but they aren’t even changing anything. Why? Because they aren’t afraid of losing their jobs. They believe their jobs are secure, because so far they have been. That’s why I’m running for office. 1) As I already pointed out, the media supports warfare. They always have. The New York Times, The Washington Post, all of the networks, throughout our history have supported every single major war at its outset. And considering what media’s role is in society, when they support a war, they’re as much salesmen as they are anything else. Legendary Tom Brokaw even said, “All wars are started on propaganda” while somehow attempting to defend the media’s role in not calling the government to task for pushing the propaganda in the first place. Essentially, the media acts as an agitator, stirring the people up to support warfare, and that’s the primary reason support is always so high at the outset. 2) We, as patriotic Americans, are stirred up by the media, but ultimately we have very little say in whether or not our government gets our country into a foreign war. So, most of us, as patriots, want to support our military, and support our government, through what is assumed to become a trying time. It’s wishful thinking. But the longer a war drags on, and the more the public feels its losses as our sons and daughters, mothers and fathers come home wounded – or not at all – we grow weary of it. This looks a lot like the data in my piece on the War On Drugs, huh? The more we fight terrorism, the more terrorism we get. I know, let's have a war on the middle class, a war on healthcare, and a war on education. Those things could only get stronger after we declare war on them. If I’m elected to congress, I will be one congressperson who is willing to skip past the early support and try to look at how proposed wars will be viewed years into the future. Conservatives and liberals alike are tiring of this never-ending War on Terror. In December of 2016, The American Conservative pointed out that terrorism is increasing the most in the exact countries where our government is the most involved in combating it – Syria, Afghanistan, Pakistan, Nigeria, and Iraq. They also point out that it’s a war that cannot be won. And liberals have also come to the realization that the War on Terror is actually making terrorism worse. 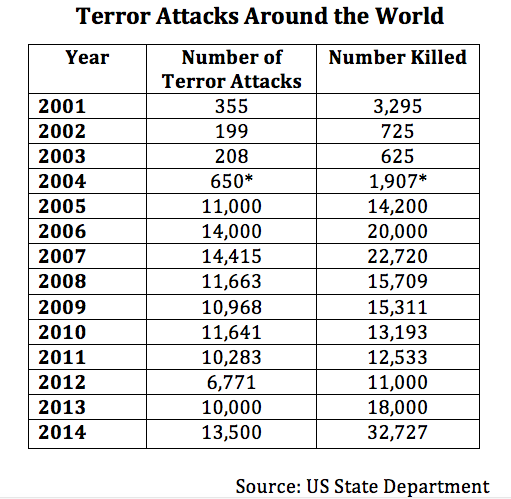 Of course the War on Terrorism is making terrorism worse. Classified paperwork detailing President Obama’s drone-strike policy was leaked to The Intercept in 2015, and it revealed that the way our military intelligence counts the dead in a drone strike is basically an outright lie, because the only civilian casualties they count as such are people who can be proven not to be males of fighting age. That means any males of fighting age killed in the strike are considered “enemy combatants” regardless of whether or not they actually were. And even then, the numbers are entirely inaccurate. The Bureau of Investigative Journalism estimated the true number of civilians killed in drone strikes to be as many as 1350 from 2004 through part of 2015, in Yemen, Pakistan, Somalia and Afghanistan alone, while the Obama Administration in 2016 claimed “up to 116” civilian casualties. This accurately illustrates the problem when any society begins to allow the government leeway with domestic security. With the USA PATRIOT Act of 2001, American liberty was quickly swallowed by this overriding push for "security." We need to re-prioritize because this cannot be "the land of the free" or "the home of the brave" if we're too scared to allow our fellow Americans their freedom. Obama’s count left out Afghanistan, Syria, and Iraq, and the BIJ’s numbers left out Syria and Iraq as well. But in July of 2016, one series of US air strikes on one village in Syria killed at least 73 civilians, including women and children. Every single civilian who’s killed in US Military or Allied air strikes leaves behind family and friends who will often become terrorist sympathizers, or even terrorists themselves. I believe many of us would feel the same way if a foreign power was flying over us and killing us with impunity. A lot of us would try and fight back. It’s human nature, and people living in the Middle East are just as human as any of us. This, ultimately, is why we have the wolf by the ear. “Self-preservation,” in the short-term, might say we need to hang on to the wolf’s ear, but “justice” will not be achieved for the people in that region until we let the wolf go. It’s possible letting go will get us bitten, but that’s going to be true regardless of when we decide to let go, and we know we have to let go at some point because we can’t keep doing this forever – nor should we. I believe now is the time to let go of that wolf’s ear. We need to get it over with, and then avoid grabbing another one. We need to stay out of other people’s countries and end this policy of policing the world as if it’s ours alone. It’s not. The country we have here is wonderful. If we want to keep it that way, we need to focus our attention, money, and effort here, not there.